It was with great interest that I read the story of Avaya’s spending bankruptcy. The first thought that I had emanated from the summary of the story which stated that the owners of Avaya were having difficulty meeting the debt payments that they had incurred in purchasing the company. Avaya was purchased by Silver Lake and TPG Capital for $8.3 billion in 2007. The intent was to grow the company and take it public. Due to market changes and slipping performance, a public offering was abandoned. Today, the move towards cloud PBX solutions by Avaya’s competitors has increased while Avaya continues to sell hardware based TDM and IP based PBXs with limited success in the growing cloud PBX space. It is for those reasons Avaya is facing the alternatives of bankruptcy or selling off parts or all of the company. The debt payment issue is a result of Avaya not properly positioning itself sooner with a cloud PBX solution. Avaya announced their move to IP PBXs and eventually into the cloud with some fanfare. But they remained behind with Cisco, Microsoft, BroadSoft and others with both strong Cloud PBX Solutions and the commitment to make them successful. Avaya had 22% share (Eastern Management Group) of the PBX market in 2010 and has seen a drop in that share to 17% (IHS) in 2015 and that is in a shrinking market. 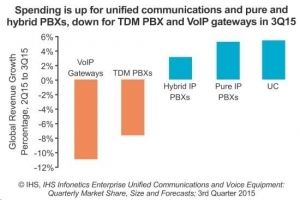 Today, new TDM PBX sales and additive lines for existing TDM PBXs continues to drop, and the growth of the IP PBX is less than that of cloud PBXs. The reasons for the disparity in growth between PBXs and Cloud UC are cost, scale, future-proofed technology, features, customization and more. Unified Communications (UC) via the cloud is the new way for businesses to conduct business communications and collaboration. OTG Consulting represents the best VoIP and Cloud Solutions in the market for SMBs and enterprises. So, if you are interested in providing your business customers with the proven UC solutions, contact OTG Consulting and become an agent.